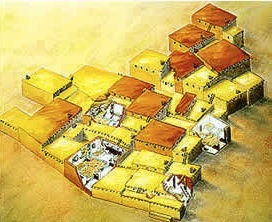 "STONE AGE" CITY: Reconstruction of the city at Catal Huyuk from 3500 to 2700 BC with cutaways for kitchens, bedrooms and living quarters. All major statuary was feminine. With this run-down of the matriarchal history and feminine religion which constitute the first nine-tenths of human life on earth, the preface to The Feminine Universe sets the scene for the rest of the book. This breathtaking volume, with its mistresslike exposition of the Primordial Tradition, followed by the most penetrating analysis of the flaws of modern patriarchal civilization, begins with a brief historical prelude reminding us who we are and where we came from. "The Feminine Heritage" reviews our matriarchal history and reminds us that not only was there a time before male dominance and the gods of war, but that it constitutes the very basis of our civilization and the vast majority of our history. It is remarkable that the many varied and highly expert author-archaeologists in the excellent series Ancient People and Places express their wonder at the evidence they have found that women were once pre-eminent in each of their areas of research, from the Near East to Ireland. Each writes as if this ancient dominance of women were unique and peculiar to his archaeological province. Yet taken all together these archaeological finds prove that feminine pre-eminence was a universal, and not a localised, phenomenon. [Our present civilization stems from] a common cultural inheritance throughout an area extending from Mesopotamia to Egypt and the Ganges to the Mediterranean, [founded upon] the worship of the Great Mother. Turning from the 'historical' to the 'prehistoric' period—that is to say, to that vast majority of human history for which written records no longer exist or have been re-written by patriarchal redactors—the material evidence makes it clear that the religion of the feminine Deity was predominant for thousands of years. We may go back further, say to the Gravettian-Aurignacian cultures, sites of which have been found in Spain, France, Germany, Austria, Czechoslovakia and Russia, and recently as far afield as Anatolia in the Near East. Some of these sites date back well over 25,000 years, and in these virtually all statues, divine or human, are female. In the period after 9000 b.c., the pattern tended to follow that stated by Mellaart in connection with ancient Hacilar (c. 5800 B.C. 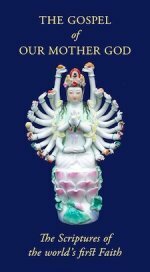 ): "The statuettes portray the Goddess and the male appears only in a subsidiary role". But in the older Gravettian-Aurignacian cultures, the male scarcely appears at all. What we have is a vast preponderance of stylized female images, known to archaeologists as "Venus figures". We might go back further still, for example to the Venus of the Wildenmannisloch Cave, which is at least seventy thousand years old, but as we recede into such distant eras, dating and interpretation obviously become more difficult and conservative scholarship becomes cautious. Let us, therefore, remain with the wealth of well-attested and generally accepted fact. What were they like, these prehistoric civilizations? Archaeologists refer to them as Palaeolithic (old stone age), Neolithic (new stone age) etc.—terms which to the average person imply brutish 'cave-men' dressed in skins and barely able to speak. Serious archaeologists have not believed in this popular myth for the best part of a century now, but the discoveries of the last forty years in Europe and the Near East have shown that it is so far from the truth as to be ridiculous. Cutaway reconstruction of part of a building at Hacilar, circa 5800 BC. Statuary predominantly feminine with occasional male figures in subsidiary roles. 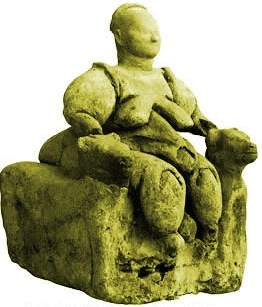 Enthroned Lady: One of countless regal feminine figures at Hacilar. Male figures are rare and subordinate. It is also likely, judging from the complete absence, rather than subordinacy, of the male image that, at least in many places, the centre of civilization was a predominantly feminine affair in which men played little part, and in which relations between women, at least among the upper echelons of society, were considered more important than their relations with men. This would be parallel with the pattern in patriarchal societies such as ancient Athens, pre-20th century academic communities, religious hierarchies and so forth. For a refutation of the modern academic attack on the concept of matriarchy, see The Myth of the Myth of Matriarchy. 1 The Enuma Elish (earliest text) Tr. Muss-Arnolt. 4. Peter N. Buck, Vikings of the Pacific, University of Chicago Press, p 73. 5. Reik, op. cit., p.101. 6. E.g, Jeremiah. Ch. 44, vv. 16-19. 7. James Mellaart, Earliest Civilizations of the Near East, McGraw Hill, p18. 9. Marija Gimbutas, The Gods and Goddesses of Old Europe, 7000–3500 B.C., Thames & Hudson, pp.236–237. 10. Mellaart, The Neolithic of the Near East, Thames & Hudson, pp.111–113. 11. Ananda Coomaraswamy, A University Course in Indian Art, Raja Singam, p.34. 12. Mellaart, Catal Huyuk, McGraw Hill, p.184. 13. Seltman, The Twelve Olympians, Apollo, p.27. 14. Graves, op.cit. I, p.15. 15. Bachofen, Myth, Religion and Mother Right, Princeton University Press, p.112. 16. Marija Gimbutas, Op. Cit., p.238. This brief preface on matriarchal history is taken from The Feminine Universe. If you are using another currency it will be translated automatically into dollars. Click the button to start the Ancient Wisdom on its journey to your heart. Cyclical Time or Spiral Time?